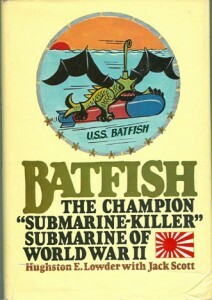 “BATFISH” The Champion ‘Submarine Killer’ Submarine of World War II. By Hughston E. Lowder with Jack Scott. Over her seven war patrols the USS Batfish (SS-310) earned nine battle stars, sank fourteen enemy ships, conducted several surface attacks, and rescued downed bomber pilots from the East China Sea––all fairly typical for an American submarine in enemy waters during World War II. But on her sixth war patrol, Batfish made history! In February 1945, only four Japanese submarines remained in Philippine waters. Batfish encountered three of them and sank each in as many days––something that has never been done before or since. 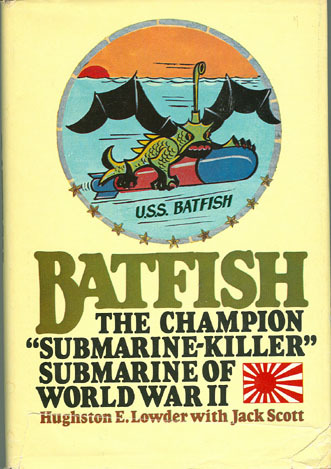 Author Hughston Lowder was a radioman and soundman aboard Batfish in World War II and served aboard the sub from the very beginning. Batfish was constructed at the Portsmouth Naval Shipyard in New Hampshire, launched May 5, 1943 and commissioned on August 21, 1943. Here is the fantastic World War II story of the USS Batfish, including her unusual voyage to her new museum home in Muskogee, Oklahoma. The unique submarine’s dramatic career. Here, too, are the rigors of Batfish’s first shakedown cruise, her later dangers of moonlit nights and Pacific typhoons, the terror of being depth-charged by relentless Japanese pursuers, and even being mistakenly bombed by American planes! This is a rare 1980 Hardback with dust jacket––a Book Club edition. Dust jacket shows signs of wear. 251 pages, 18 black and white photos, index and a USS Batfish crew roster, no maps.